Saint Ildephonsus was a Visigoth born into a noble family, but the date of his birth in about 607 is not known for certain. He was tutored by Saint Isidore of Seville, and then became a Benedictine monk against the wishes of his father while at a young age. He was ordained a deacon in about 630, and in 657 was called to the archiepiscopal throne in Toledo, the Visigothic capital of Spain. It is remembered with great affection and devotion that he was the recipient of a privileged gift he received directly from the hands of the Queen of Heaven. It happened shortly after sunrise. Saint Ildephonsus had been feeling somewhat uneasy for several days, sensing that something important was going to happen. He left the archiepiscopal house early to attend Matins in the great church dedicated to Mary. As usual, he was accompanied by his servants, chaplains, and priests, all of whom enjoyed the verses of praise he composed in his devotion to the Immaculate. The pages when ahead to make the preparations while Saint Ildephonsus approached the main door. His conversation with the visiting bishop and archdeacon was abruptly interrupted when the pages ran out of the church terrified. The reason for their dismay was the vision of radiant lights inside the church that had to be of supernatural origin. The priests and the others who followed Saint Ildephonsus into the church dared not cross the threshold, remaining outside in fear. It was thus that only Saint Ildephonsus and two companions fearlessly entered to see what had transpired. In their uncertainty they walked slowly up to the main altar, but other than the bright light, they at first didn't notice anything out of the ordinary. The trio knelt before the Sacramental Christ thinking to pray a few moments, though Saint Ildephonsus immediately noticed that he was unable to pray with the usual concentration and fervor. Then, turning his head, Saint Ildephonsus saw that there was someone seating in the Episcopal chair he normally occupied. It was a woman of indescribable beauty, radiating a resplendent halo of untold glory and majesty. Beside her, Saint Ildephonsus began to notice thousands of angels and choruses of virgins singing sweetly. The saint understood at once that this woman was none other than the Holy Mother of God. Taking leave of his two companions, Saint Ildephonsus fell on his knees before the lady, his gaze saying what his lips could not, bound by admiration and complete astonishment. The Mother of God looked at Saint Ildephonsus with a tender smile on her lips and gestured for him to approach nearer. The saint obeyed, bowing deeply until he reached her feet. Once there he fell on his knees again, hiding his face in his hands, without even daring to look up. "I have come to visit you because you have always taken care of my service and praises, and because with great faith you have defended my honor. For all of this I want to pay you in this life what I owe you. Take and enjoy this chasuble that I bring you from the treasury of my Son, to make use of it in your sacrifices and to serve as a token of what is waiting for you in heaven when your mission has been fulfilled in this earthly life." And while saying these words, with her own hands, she put on his shoulders a precious chasuble whose embroidery and fabric no human hand could ever hope to fashion. Dressed by the hand of Mary, the archbishop rose as he bowed reverentially in gratitude. The Queen of Heaven then smiled, as if accepting the gratitude of her most loyal servant, and then joined by her heavenly companions, vanished like mist in the air. Only then the companions of Saint Ildephonsus came forward, having witnessed all that had transpired. Those who had fled the church and remained outside waited there until the church had returned to normal and all the lights were gone. They entered the church to meet with the bishop and immediately felt the atmosphere of unimaginable happiness. Greeting the bishop, they met him with shouts of joy, and he greeted them with love, showing them the chasuble and weeping with them. The church bells began to peel cheerfully without anyone touching them, awakening the neighborhood. The news of what had happened went from home to home, and from neighborhood to neighborhood. There was not one who upon hearing of what had happened did not drop what he was doing to go to the church. Soon, the entire population of Toledo was concentrated at the church on the day of its greatest splendor to accompany the bishop who had given the most glory to the church of Toledo. According to tradition, Saint Ildephonsus’s successor, Siagrius, tried to put on the garment, but died in the act of putting it on. The garment was said to have been seen and touched by Herbert Losinga, Bishop of Norwich, as late as the eleventh century. There are those who say the present location of this chasuble of Saint Ildephonsus is not known, or that the story is only legend, but neither of these assertions is correct. This celestial gift is still preserved and is now kept at Oviedo. Alphonsus, the chaste King of Castile, transferred it to the church of Saint Savior which he had built. It, along with the Sudarium of Jesus Christ, and many other relics, is contained in the Holy Chest of Oviedo. The Spanish hero Rodrigo Diaz, better known the Cid, was a living witness when the chest was opened in his presence. 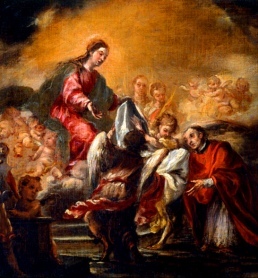 In the Cathedral of Toledo, in the chapel that bears the name of Saint Ildephonsus, the stone is venerated where the Virgin stepped during this famous miracle. This stone is very revered by the believers of Toledo, who cannot go to the church without touching it. There is an inscription that reads: "When the Queen of heaven laid her feet on the ground it was upon this stone that she stood. Touch the stone, saying in all devotion, 'We venerate this place where the Blessed Virgin has laid her feet.'"